Situated among the glittering skyscrapers of Canary Wharf, and on the stunning waterfront in the Crossrail Place development, Everyman Canary Wharf cinema is a striking luxury venue that’s ideal for a wide range of different events. Boasting three screens, a sophisticated seating plan featuring elegant sofas and armchairs, and a spacious and buzzing statement bar, this is one venue that’s sure to impress and amaze in equal measures. If you’re seeking a cinema in Canary Wharf for your next impactful event, and need a venue which packs in equal quantities of style and substance, then look no further than Everyman Canary Wharf. This incredible cinema venue never fails to go the extra mile when it comes to cutting edge events, and it’s ideal for a wide range of functions – from elegant exclusive meetings, to product launches, private screenings, and much, much more besides. At Everyman Cinema Canary Wharf, excellence comes as standard. Each of the impressive auditoriums in this venue is uniquely designed, and boasts the highest picture quality and latest in digital projection, making its versatile screens perfect for business presentations, networking events, product launches, Q&A sessions, promotional activity, conferencing, team training, social events and celebrations. Over the years, this cinema has played host to a massive array of different events, and each one has been handled with the expertise and professionalism which this venue has become renowned for. 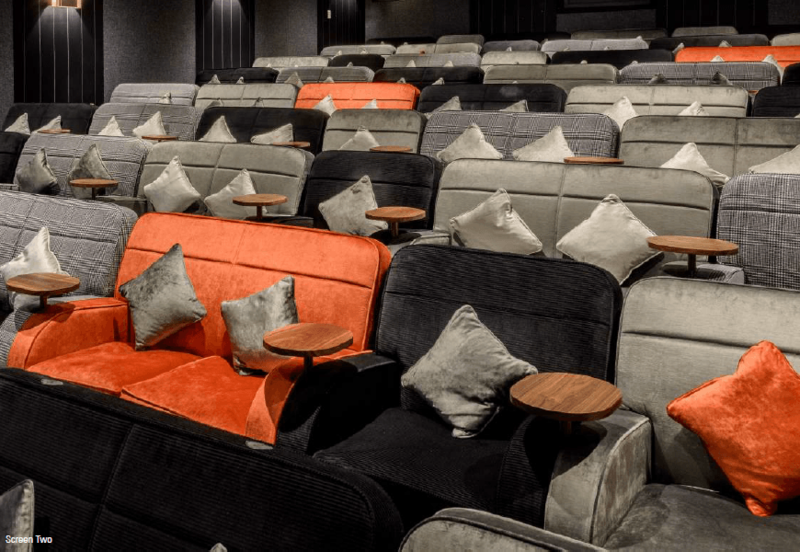 This luxury cinema in Canary Wharf is known throughout London for hosting immersive and multifaceted popular events, such as the Everyman Music Film Festival, which promises to bring guests a whole host of music-related films, special showings, and Q&A sessions. This event gives cinema-goers a chance to delve into the world of music across a week of live scores, unique screenings, and fascinating insights into how the music industry and world of cinema have collided across the past century. For literary fans, the Oscar Wilde Live! event also promises treats aplenty, and there are many, many more special screenings and events on the horizon. The Venueseeker events at this Canary Wharf cinema regularly wow guests with their use of space and the facilities available, and make the most of this striking central events venue in London’s high-flying heartland. If you primarily associated cinema catering with stale popcorn, inedible hotdogs, and little else but pick ‘n’ mix sweets, prepare to have your mind (and taste buds) blown. Everyman Canary Wharf’s renowned hand thrown homemade pizzas, sweet and savoury snacks and delectable cocktails are available to preorder upon request, and represent a new wave in high-quality cinema food and drinks which is sure to make a lasting impression on your guests! At Everyman Cinemas Canary Wharf, you’re never far from a cinema experience that really ramps up the decadence and elegance. Rich textured plum wall panelling and bands of dark chartered timber decorate the walls with luxury sofas and armchairs upholstered in vibrant pinks and purple velvet. This contemporary screen seats 109 and is perfect for business presentations, speaker and panel events. Taking guests into a world of sharp, smart interior design, Screen Two is an experience in its own right. Accommodating 105 guests, this screen is upholstered in black and silver velvet tweed with smart pinstriped panelling and classic bronze wall lights. With laptop connectivity via HDMI and PA Systems compatibility this is perfect for Q&A sessions, awards ceremonies and much more. This intimate screen features 52 luxury sofas and armchairs which are upholstered in tan leather and green velvet. Retro wave patterned panelling, trimmed in brass, run across this screen’s walls. All seats offer plenty of legroom and a wine cooler with a table for drinks and snacks. This cosy screen is compatible with laptop hook up (HDMI) and PA systems making it ideal for an intimate event.